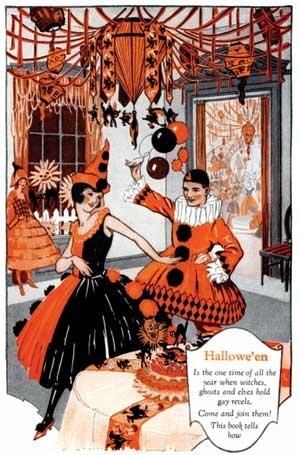 Thanks to Jazz Age content marketing, business girls never had to sweat over throwing a nifty Halloween blow. The Bogie Book showed 'em how. Buy a Dennison Halloween "lunch set," complete with a crepe paper tablecloth, paper plates and paper napkins. Buy Dennison crepe paper sashes for the guys, headbands for the dolls. Make place cards and a table centerpiece from cardboard and Dennison crepe paper; a chandelier from wire and Dennison crepe paper; and window curtains and valances from Dennison crepe paper. Decorate the rest of the room with black cat cardboard cutouts from Dennison. For appetizers, serve pumpkin doughnuts wrapped in Dennison crepe paper; fruit cocktail in a Dennison paper cup wrapped in Dennison crepe paper; candy wrapped in Dennison crepe paper; and apples topped with Dennison crepe paper goblins' hats. Keep the main course simple: chicken patties and potato chips. Serve ice cream, cake and coffee for desert. Prepare everything a day in advance, so you can assemble it quickly when you get home from work. As Dennison was a family-friendly firm, no instructions were included for hiding the hooch (illegal due to the Prohibition).